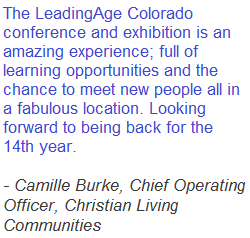 Exhibitor registration for the 2019 LeadingAge Colorado Annual Conference & Exhibition to be held May 13 - 15, 2019 is now open. The EXPO will take place May 14, 2019. 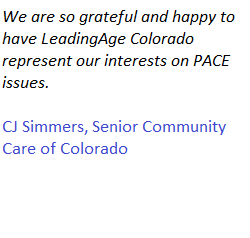 For additional details and/or inquiries, please see attached or visit https://www.leadingagecolorado.org/exhibit-sponsor. 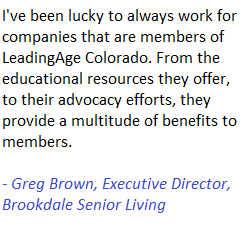 LeadingAge Colorado recognized twelve individuals who are charting the course for the next wave of senior living and aging services. 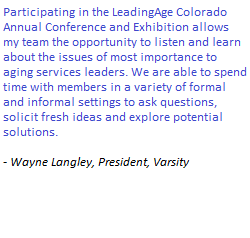 The Emerging Leaders represent a mix of experienced and next generation leaders who work in senior living and aging services, as well as organizations that support these services. 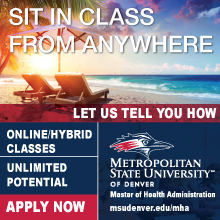 Meet the 40-hour training requirement to become an assisted living residence administrator as set forth in the revised Colorado Department of Public Health and Environment’s (CDPHE) licensing regulations governing assisted living residences, which became effective in mid-2018. This course is also recommended for owners, administrator designees, CEO’s, COO’s, resident services directors, nurses, social workers, and marketing/admissions staff. Read more. Beginning Jan. 1, 2019, employers that serve at-risk adults, including assisted living residences (ALRs), PACE programs, nursing facilities and adult day services programs, must request a CAPS check prior to hiring employees who will be providing direct care. The database contains the names of individuals who have been found by APS to have mistreated at-risk adults. After Jan. 1, CDPHE will check employee files as part of their regular survey processes to determine if the database was checked on new employees. Employers who are mandated to request a check of the Adult Protective Services data system (CAPS) must register with the CAPS Check Unit (CCU) before those requests can be made are strongly encouraged to register before Jan. 1. The Colorado Department of Public Health and Environment’s (CDPHE) announced a three-year grant obtained from the Centers for Disease Control and Prevention (CDC) to fund a full-time Environmental Protection Specialist to conduct food safety inspections in ALRs with 20 or more beds. The inspections will be conducted yearly for the next three years and the ALR survey team will no longer be inspecting the kitchens, nor will any of the county health departments. Beginning Jan. 1, 2019, employers that serve at-risk adults, including assisted living residences (ALRs), PACE programs, nursing facilities and adult day services programs, must request a CAPS check prior to hiring employees who will be providing direct care. The database contains the names of individuals who have been found by APS to have mistreated at-risk adults. Employers must register prior to asking for a check and CDHS must respond as soon as possible but no later than five days from the day of the request. The rules set a maximum fee for the check at $16.50. CDHS has a dedicated website for more information. 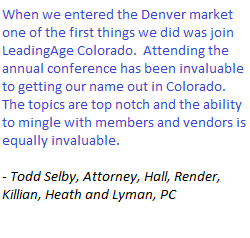 The best and brightest industry professionals are out there. 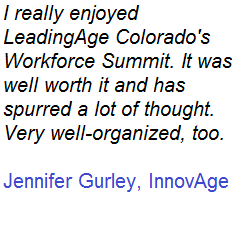 Access this targeted and qualified pool of talent by advertising your jobs on the LeadingAge Colorado’s new Career Center. We know that Recruitment and Retention are some of the biggest pain points in Senior Living and Aging Services, so we worked with Denise Scott to design a 7-part Series of webinars and in person events to assist you in tackling one of your biggest challenges in workforce development. Each session is designed to walk you through the entire process from recruitment to retention while providing content rich tools and support throughout. The complete brochure can be viewed here. In May, Gov. Hickenlooper signed into law a bill containing extensive requirements for public and private entities that maintain the personal information of Colorado’s residents. The new law covers what steps must be taken by all providers of senior living and aging services to protect data, what to do in the event of a breach and how to dispose of certain types of personal information. The law’s requirements take effect Sept. 1. 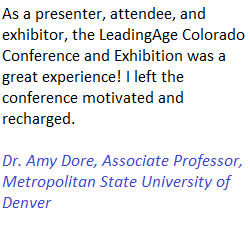 Join us for the Assisted Living Conference showcasing all things Assisted Living! This is a great opportunity for you to connect with your peers and learn about the biggest issues facing you today. View program and register today. On July 13, the Medical Services Board gave initial approval to the draft alternative care facility rules updating the rules and including requirements mandated by the federal home- and community-based services (HCBS) settings rule. 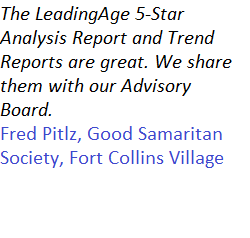 LeadingAge Colorado submitted comments to the board ahead of the meeting and provided comments during the hearing. 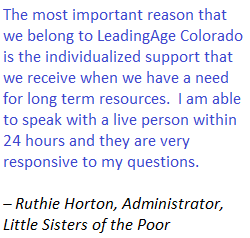 LeadingAge Colorado was the only association present and focused their comments on changes to the staffing requirements. Reminder: Members are encouraged to check the Colorado Department of Public Health & Environment’s (CDPHE) new ALR resource page designed to help keep ALRs informed about the implementation of the new licensure regulations. The page contains continuously updated information on important dates, training, FAQs and the Assisted Living Advisory Committee (ALAC). In a recent memo to providers, the Department of Health Care Policy and Financing (HCPF) announced that the 25 percent increase for ACFs included in the state budget signed by the governor on Monday is anticipated to take effect Oct. 1. The increase must be approved by the Centers for Medicare and Medicaid Services (CMS). 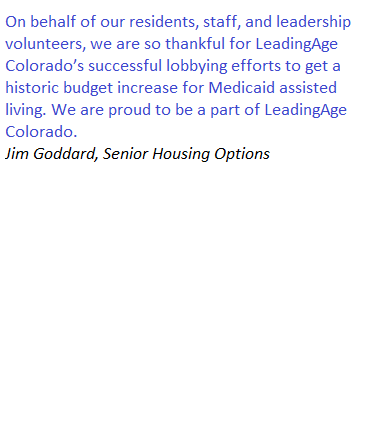 Today LeadingAge launched a petition to expand and protect affordable senior housing. This petition is part of our effort to engage and grow the Seniors Action Network. Members are encouraged to sign the petition that tells Congress we must invest more in affordable senior housing and reject the President’s proposed 22 percent cut to next year’s U.S. Department of Housing and Urban Development’s (HUD) budget. Sign the Seniors Action Network Petition for Affordable Senior Housing and tell Congress to make older adults a priority. The Board of Health (BoH) will hold a public rulemaking hearing for the revised Chapter 7 assisted living residence (ALR) licensure rules on April 18 at 10 a.m. in the Sabin-Cleere rooms on the first floor of the Colorado Department of Public Health & Environment’s (CDPHE) main campus at 4300 Cherry Creek Drive South. The draft includes several changes for ALRs, including minimum standards for administrators, requirements for CPR, first aid and lift assistance, implementation of the Facility Guideline Institute (FGI) standards for new construction and renovations, and revisions to the secure environment section. These are challenging and exciting times. 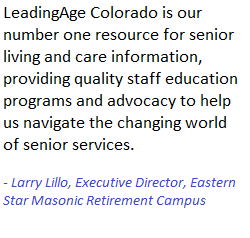 As LeadingAge Colorado turns 50 this year, we celebrate our humble beginnings, five decades of growth and diversification, and we look with optimism to what lies ahead for our association and our members. 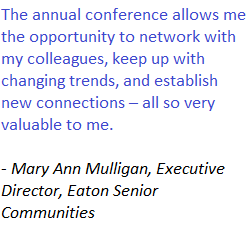 There are great things in store for this year’s conference. And don’t miss the exhibition, the place to meet and visit with companies who supply the goods and services you use every day. Last month, the Board of Health (BoH) approved a rulemaking hearing for the revised Chapter 7 assisted living residence (ALR) licensure rules. The public hearing will be held April 18 at CDPHE. The draft includes several changes for ALRs, including minimum standards for administrators, requirements for CPR, first aid and lift assistance, implementation of the Facility Guideline Institute (FGI) standards for new construction and renovations, revisions to the secure environment section and licensure fee increases. 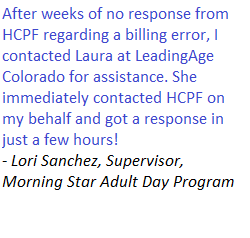 On Jan. 30 the Colorado Department of Health Care Policy & Financing (HCPF) released FAQs that focus on general requirements of the federal home-and community-based services (HCBS) final settings rule and miscellaneous aspects of its implementation. Part 2 will address employment-related service and lease requirements. Providers are encouraged to review all the FAQs as compliance with the rule is expected by March 2020. On Jan. 30 the Colorado Senate unanimously passed SB18-054 by Sen. Larry Crowder that caps assisted living residence (ALR) licensure fee increases at the consumer price index (CPI) beginning in 2019. 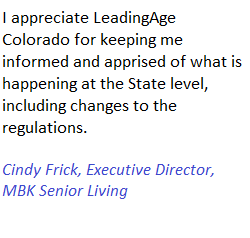 This bill supported by LeadingAge Colorado, allows the board to increase the fees over two years (2018 and 2019) to fund enough CDPHE surveyor positions to inspect every ALR every three years and investigate every complaint. Last month, the governor released his FY 2018-19 state budget proposal. It includes both increases and decreases in provider rates, including a 25 percent increase for alternative care facilities, a .77 percent increase for other HCBS providers and a decrease to nursing home rates by limiting the allowable growth for one year to 1 percent, instead of 3 percent.